If you were the only person on the planet, chances are you wouldn't bother having a clock. We use them primarily to synchronize ourselves with other people, so that lunch dates and meetings and phone calls can happen without one party or the other having to wait around for a long time. We just agree on a time when we'll both be there. Clocks have been pretty useful for this - until now. It's hard to keep track of how many hours the time gap is between where you're standing and where your overseas distributor is located, whether you're speaking in terms of your local time or theirs, and whether to add or subtract the difference when figuring out what your watch should say when you make the call. It's worse if either or both of you happen to be traveling, which is increasingly the case now that we all have cell phones, and the fact that there's also Daylight Saving Time which starts and ends on different days in different countries makes things enormously complicated. Some of us waste a lot of time trying to clarify these details (and then we screw it up anyway). Wouldn't it be nice, and much simpler, if we could all agree on what time it was, all over the world? At first I thought we should just use unaltered Greenwich Mean Time for everything and call it a day. I'd be all right with that, frankly. Computers do it. The only problem is that we've all become accustomed to having certain numbers line up with certain parts of the day, and having the clock "roll over" in the middle of the night (and also at mid-day if you're using the 12-hour system). To move the numbers feels peculiar, and to change them more for some people than for others feels unfair. This is an inherent problem with any time marking system that uses numbers, or letters, or anything else where there is a hierarchy and a point where you return to the beginning. What would be better is a time marking system that forms a natural loop without feeling like it has any particular beginning or end, and without us having habitual expectations about which part of the cycle lines up with which part of the day. That's where the color wheel comes in. We can simply decide that at some particular point, the time is "orange," everywhere on the planet. Later on it will be yellow, green, teal, blue, maroon, and so on, and eventually orange again. In my part of the world, people tend to wake up in the blue range, eat lunch around lavender and get off work at orange, but elsewhere it may be that you wake up at yellow and have dinner at purple. Neither seems to make more sense than the other, which is exactly the point. And then if we want to have a phone call, we can arrange to speak at thirty minutes past indigo, and there is no confusion about exactly when that means. And so I decided to implement this clock, as an arbitrary standard for coordinating time around the globe. 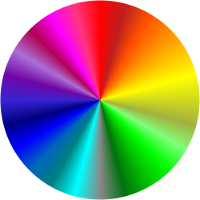 The first version of the clock used a basic algorithmic color wheel, with a hue moving smoothly around the RGB space like a color-picker in a graphics program. It was simple, and it was bright. Unfortunately, the values didn't vary quickly enough in many cases, so that a whole hour might pass by with very little discernable difference in the color. The savvy time consumer will want to be able to tell one hour from the next, so something had to be done. I tried varying the saturation of colors in addition to the hue to get a little more variety. It helped, but was still not enough. I tried schemes based on HSV instead of RGB, but ultimately no simple function was satisfactory. The fact that the human eye can detect more subtle variations in color in different parts of the spectrum proved problematic. What you see here is not a simple algorithmic function, instead, it is hand-crafted to try to get an effective spread of viewable colors around the dial. It is neither perfect nor optimal - nor can it be, since the ability to discern color differences varies between individual humans - but it's not bad. This is still a bit of a beta version... comments welcome! What About the Color Blind? What about the color blind, you may ask. And well you should - there are more color blind people around than you realize. I know some, and so do you. Fortunately, colors have names, and even someone who is completely blind will be able to tell the difference between "half past pink" and "9 minutes to mustard." As anyone who has ever had a discussion about color with another person can tell you, it is not possible to come to universal agreement about what constitutes orange versus red, much less lavender versus lilac. There are physiological reasons for this, with studies indicating that men and women experience color differently, and that no two individuals perceive color exactly the same way. With that in mind, although I did solicit some feedback on what to call the twenty-four colors that mark the hours, I pretty much just named them by fiat, because decisions had to be made. You can send me email to complain that gold should be marigold or lavender should be lilac, and I might listen... but probably not. The official Phrenopolis Color Time Clock is available for Android phones! There's a free, ad-supported version and also a swanky, feature-rich one-dollar version. Download now! Coming later in response to the inevitable demand. Until then, use the web page and watch this space. I wrote this as part of my Poem of the Week series, some years ago when I was first postulating International Color Time. But Dave... what about the date? Isn't that still--Quiet, troublemaker! Just enjoy the clock.